Hugo Grotius was born in Holland in 1583. A child prodigy, he was admitted to Leiden University when he was eleven years old. Sectarian disputes divided seventeenth-century Holland and, in 1618, Calvinist Prince Maurice of Nassau imprisoned Grotius for his Arminian sympathies. However, the conditions of his confinement in Loevestein Castle were not onerous. 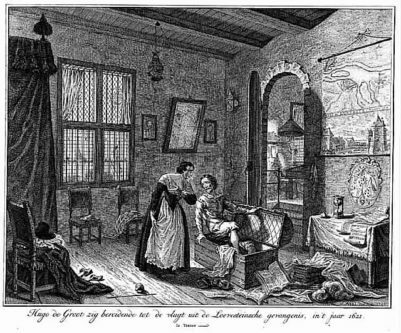 Grotius’ guards allowed his wife to visit and bring books – a lot of books. In 1621, Grotius escaped by hiding in the chest his wife used to carry books to and from the castle. Grotius then settled in Paris. While at Loevestein Castle, Grotius completed the first version of On The Truth of the Christian Religion. He then published it in 1621, immediately after his escape. This original version was in Dutch and in verse form. Grotius wrote in simple language that laypersons could understand. Grotius wanted Dutch seamen to use this apologetic work to maintain their own faith and convert the heathen during their voyages to far-flung countries. In 1625, Grotius published On the Law of War and Peace, an influential treatise on international law. He has been called the “father of international law.” Grotius argued that man’s natural capacity of reason enabled him to establish certain truths, including the existence and characteristics of God. These ideas about God were not original, but, based on this theological foundation, Grotius proposed rules of natural law to govern relations between nations. Perhaps inspired by his previous captivity, he argued that Christians should not punish nonbelievers or impose belief by force. Grotius believed Christians should impress non-Christians by their ethical behavior and offer persuasive arguments for conversion. In 1632, Grotius published the book version of On The Truth of the Christian Religion in Latin. Most legal apologists consider this to be the first the first real book of legal apologetics. The book was translated into English, French, and German during Grotius’ lifetime, and 144 editions and translations were published after his death, including Arabic and Urdu. In 1709, French theologian Jean Le Clerc edited, annotated, and supplemented Grotius’ original text. In 1711, English philosopher John Clarke translated Le Clerc’s annotated edition into the English, and that version is now available both on the Internet and in print. The language is somewhat stilted and archaic – it is not an easy read. In his introduction, Grotius gives credit to the many apologists from whom he took inspiration, but his book also developed a few new ideas. William P. Broughton claims, “Several salient features of legal apologetics as it exists today, including its structure and focus on the resurrection, can be traced back to this seminal work.” That may be true, but Grotius wrote long before English and American courts established the rules of evidence used in modern legal apologetics. When I read the book, I find it difficult to identify specific legal arguments still in use today. It seems to me that the structure and focus to which Broughton refers influenced all evidentialist apologists, not just legal apologists. Grotius divides On The Truth of the Christian Religion into six books. Book I deals with the existence attributes of God, and is similar to his previous argument from On the Law of War and Peace. In Book II, Grotius makes many of the arguments now used in both legal and nonlegal evidentialist apologetics. For example, he touts the credibility of the eyewitness testimony of the apostles, who were persecuted and had no reason to lie. 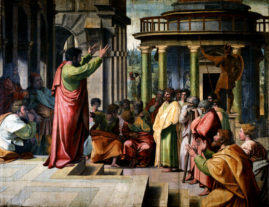 He also repeatedly argues that Christianity could not have developed unless the apostles had believed Jesus rose from the dead. This is one of the few contentions that I can identify as a legal argument. It seems to be an early version of the Ancient Document Rule, a linchpin of modern legal apologetics. He makes several other arguments – still in use today – that do not rely on any particular legal authority, but indicate a lawyer’s evaluation of testimony. For example, he asserts that minor inconsistencies among the Gospels enhance the credibility because they demonstrate lack of collusion between the gospel authors. In Books IV, V and VI, Grotius presents “confutations” of paganism, Judaism, and Islam. In sum, it is fair to say that Grotius, the father of international law, is also the father legal apologetics. He originated arguments still used today by both legal and nonlegal evidentialist apologists. Book II, section VI (1622) (The Resurrection of Christ Proved from Credible Testimony). Avery Cardinal Dulles, A History of Apologetics 174 (Wipf and Stock 1999). Ross Clifford, John Warwick Montgomery’s Legal Apologetic: An Apologetic for All Seasons 59 (Culture and Science Publications 2004).